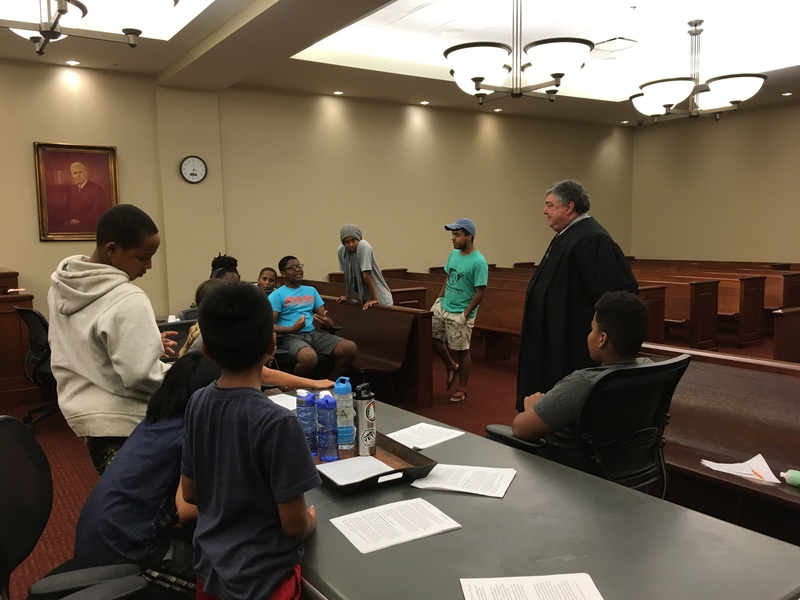 Our second week campers had a great experience on Friday learning about the right to a fair trial. In the morning, we were joined by Brian Hoffman from the Southern Poverty Law Center’s office in near-by Lumpkin, Georgia. Brian and other attorneys in the SPLC’s SIFI program work there to represent asylum-seekers who are detained at Stewart Detention Center, helping them to get a fair hearing in spite of many obstacles that current immigration policies put in their way. 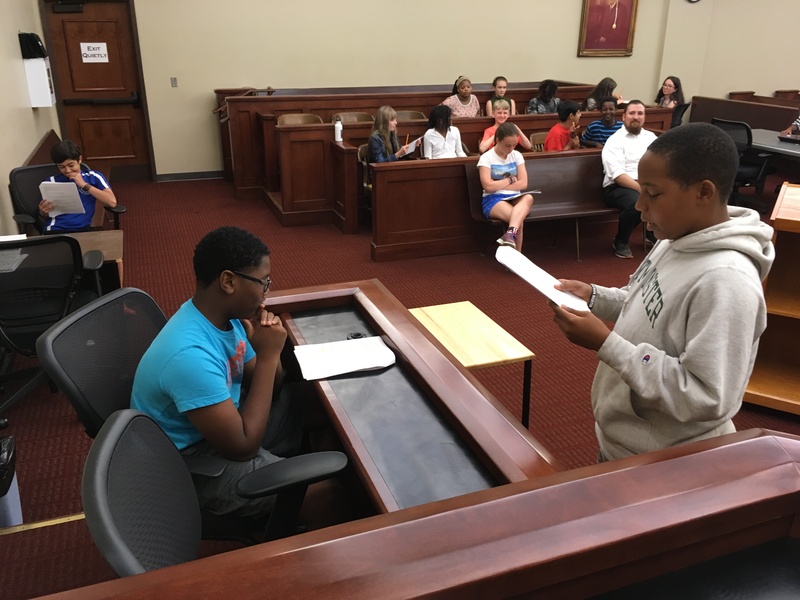 Brian was able to step in at the last minute to help us out when the public defender who was scheduled to meet with us unexpectedly had to be in court that day. We are so grateful for Brian’s generosity! hearing is fair. He also coached the campers in what to do if they are ever arrested. 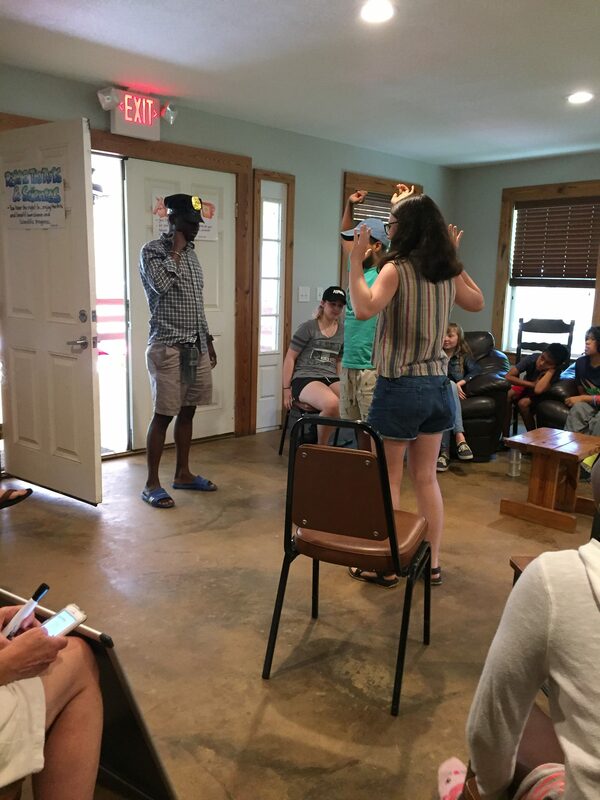 A skit by counselors Elysee, Julia, and Edgar drove home the point that a young person who is being placed under arrest needs to respectfully insist that he or she cannot make any statements without parents or an attorney present. Brian also advised them to ask an important question of the police officer: “Am I free to leave?” If the answer is yes, then leaving is the right thing to do. If the answer is no, then the officer is obligated to read the Miranda rights and the person in custody should not answer any questions until legal counsel is obtained. After lunch, we headed to downtown Americus where a courtroom at the Sumter County Courthouse was reserved for us. Brian oriented us to the courtroom, and then we began assigning roles for our mock trial. Soon we realized that we had an audience. Four officers from the sheriff’s office told us that they had been watching us on the security cameras and thought it looked like we were having a good time, so they came to join in. 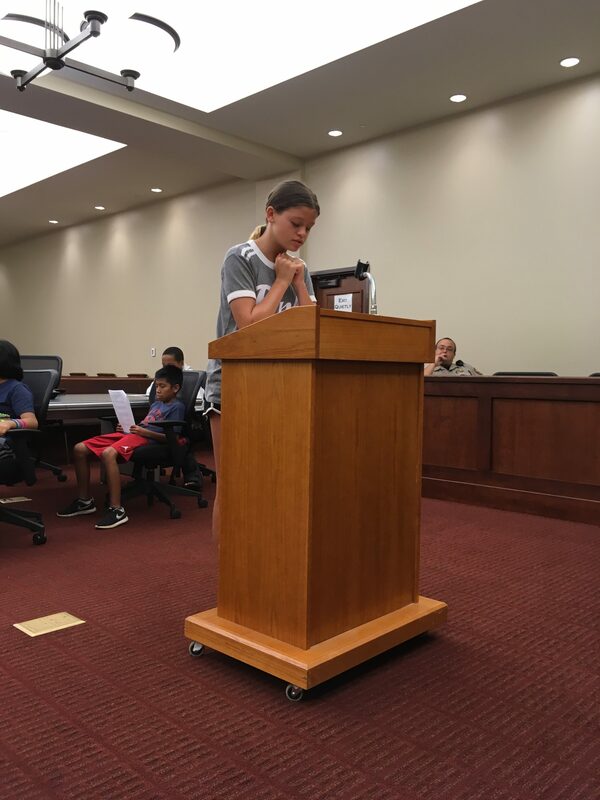 They observed the first part of the trial (in which camper Reuben was having to defend himself against accusations of receiving a stolen car, owned by camper Patrick) and when Judge Hannah called for a recess, the officers volunteered to show us all the jury room. Then they whisked Judge Hannah down to the real judge’s office and outfitted her with an actual robe. 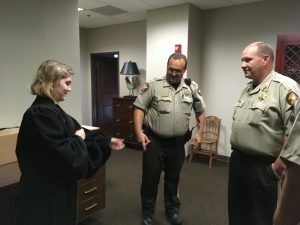 When the recess was over, one of the officers enthusiastically announced Judge Hannah’s entrance back into the courtroom, and now properly attired, she took the bench. engaged the campers in conversation, answering questions about some of the real trials they had witnessed. One of the officers decided to invite Judge Jimmy Brown of the Southwestern Judicial Circuit of Georgia down to the courtroom to meet the campers. Judge Brown graciously answered questions about his work, and when the jury reentered the courtroom, he coached Judge Hannah on how to proceed. 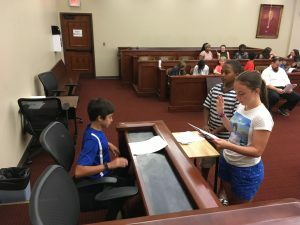 The involvement of the officers and Judge Brown was an unexpected bonus to our experience at the courthouse, and we are indebted to them for their friendly and personable interactions with the campers. 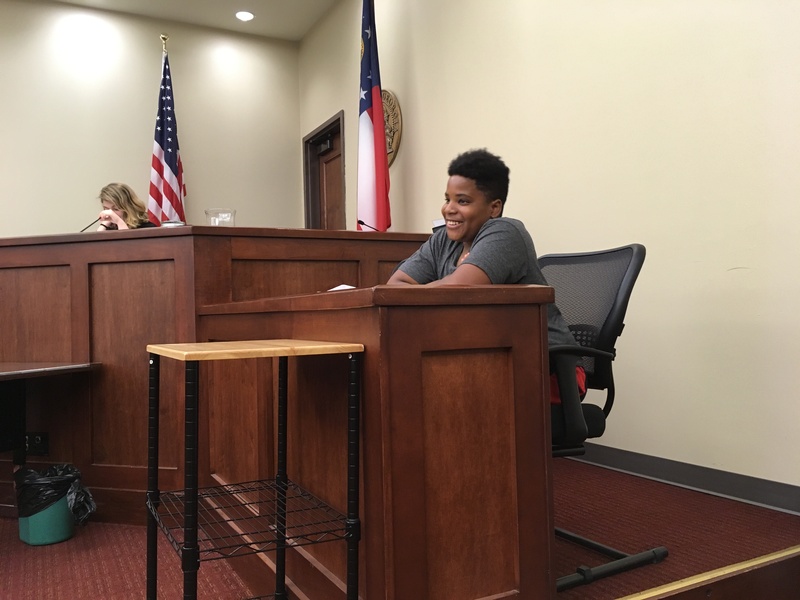 You will be glad to know that the jury acquitted defendant Reuben in spite of a spectacular performance by Assistant District Attorney Cameron. In the end, though, the real winners were all of our campers who learned a lot from all of the kind people who supported this day’s program! Many, many thanks to Brian, Judge Brown, and the great officers of the Sumter County Sheriff’s Department!